In her election rallies in South Kashmir, Mehbooba has warned that threats to abrogate the Articles 370 and 35A and also Modi government’s “muscular approach” towards Kashmir will turn the situation more gruesome and worrying. Protecting Articles 370 and 35A, that provide special status to Jammu and Kashmir, has become the foremost election issue for the Kashmir based political parties after Prime Minister Narendra Modi and other top BJP leaders have in the party’s manifesto and election rallies counted the negative aspects of these Constitutional provisions for the state. In an apparent response to PDP chief Mehbooba Mufti’s statement that the relation of Kashmir with India will break if the Articles 370 and 35A were abrogated, BJP general secretary Ram Madhav said that abrogation of these Articles has no relation with the integration of J&K with rest of the country. The state was integrated with India much before these provisions were added to the Constitution. 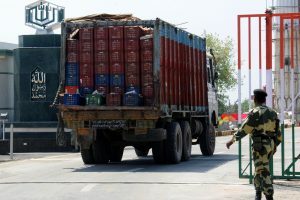 The National Conference (NC), Peoples Democratic Party (PDP), Congress and Peoples Conference (PC), whose candidates are among those in the fray for the three Lok Sabha seats of the valley, Srinagar, Baramulla and Anantnag, are in their campaign pledging to protect these provisions which they describe as the “bridge between India and Kashmir”. 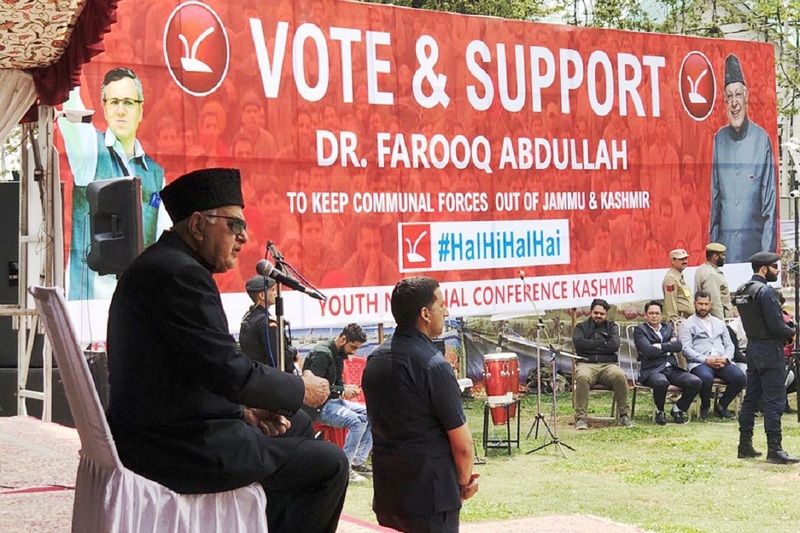 NC President Farooq Abdullah, who is seeking re-election for the Srinagar seat, on Monday held a massive rally in Srinagar where he warned that no power on earth can abrogate the Articles 370 and 35A. He accused Modi of contemplating to change the Constitution that provides special status to J&K. “These people have always shown hatred for our special status and special constitutional position and were threatening to do away with these provisions”. He urged the people to remain united and vote for the protection of “our identity and integrity of the state. NC will not allow anybody to fiddle with state’s special status”. He pointed out that the “power hungry” BJP leadership, while sharing government with the PDP in 2015, had signed an agenda of alliance in which they promised that no tinkering will be done with the Articles 370 and 35A, but after the fall of the PDP-BJP government they were again threatening to break these provisions. PDP President Mehbooba Mufti, who is a candidate for the Anantnag Lok Sabha seat, from which she had resigned to become the chief minister after the death of her father Mufti Sayeed, is batting for Self Rule formula which she described as the most pragmatic approach to resolve the decades-old Kashmir conflict. She says talks with Pakistan and other stakeholders is the only way forward and it is only through a non-confrontational approach that we will be able to give our coming generations a safer and tranquil place to live. CPI (M) leader, Mohammad Yousuf Tarigami, who is considered a more rational voice from among the other leaders, has stressed the importance of voting “to defend the identity and special status provided by the Articles 370 and 35A”. CPI (M) State Secretary Ghulam Nabi Malik has urged the electorate to contribute in the process of “evicting disastrous, authoritarian and communal government led by Narendra Modi”. Sajad Lone, chief of the Peoples Conference (PC), which is controlling the Srinagar Municipal Corporation with the support of BJP, says that the Articles 370 and 35A are sacred. The only space for movement in this regard is the reversal of the erosions. Any other reckless thought or comment seeking removal is a disaster.